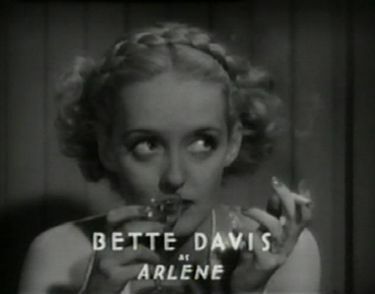 Bette Davis is Arlene, hard-partying step-sister to Val (Margaret Livingston. Again. Sigh.) Arlene is also girlfriend to rich dude Spenser Carlton played by blog fave Lyle Talbot. Arlene hangs around wild bars that are owned and run by gangsters, and even though Val goes with her, she doesn’t realize the evil what lurks about these places, because Val is angelic and perfect and blah blah blah. They even wear color-coded gowns when they’re at the club together, Val in white, Arlene in black. While drinking and dancing at the mob-run club, the boss borrows Arlene’s car and puts a stash of something stolen in her glove compartment. These turn out to be stolen securities and bonds, and Arlene, being the daughter of a famous and wealthy banker, has the ability to fence them for a cut of the profit. Boyfriend Spencer helps with the laundering — he works in Arlene’s father’s bank and has connections — but he’s so worried about the scam that he refuses to do it any more. Arlene’s father (Arthur Byron) is en epic douchebag the next morning, ranting against Arlene’s partying and pictures in the society notices as though she was the most immoral person in the world. He doesn’t know she’s fencing stolen securities, he just knows she’s in the paper. As though this were some Gothic novel, he pronounces Arlene no good because her mother was no good, and threatens to commit her to an insane asylum if she’s involved in even one more society page scandal. Way to keep the perspective there, gramps. Arlene gets a phone call and runs off to meet the mob boss, but not before putting her engagement ring in an envelope and sending it back to Spencer. After Arlene meets with the mob boss, she goes to meet someone else. At the same time her dad goes to work and discovers the bond scam and calls Spencer in; he’s more upset that Spencer was “manipulated” by Arlene than he is about his own daughter. Oh, he threatens to shoot Arlene, too. Nice. Arlene meets a man at his apartment, another man who works for her father and who is demanding some scandalous love letters he sent to her back. After this meeting Arlene never arrives home. What has happened to her? Well, for once I’m not going to tell you. Watch it in a week and find out! 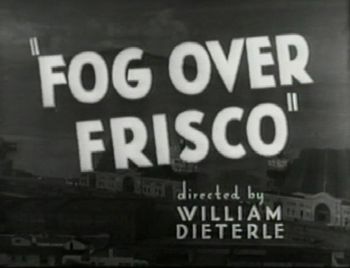 “Fog Over Frisco” is not a bad movie, I really kind of liked it up to about this part of the film. Of course, there is the little matter of Hugh Herbert, who is rapidly becoming my least favorite actor in the world. At least he’s standing next to William Demarest much of the time, whose awesomeness somewhat negates the Hugh Factor. Margaret Lindsay is not my favorite actress, at least not when she was younger. I think she’s tremendous in her character roles in the 1950s and early 60s, after she lets go of this smugness that pervades her 1930s work. That room set does look gorgeous. Were there any location shots in the film? I'm such a "set in San Francisco" film buff. Sort of. There is at least one short driving scenes which I'm certain was on location, and I think one of the scenes at a pier is, too. Otherwise it's all sets and soundstage, even during some scenes with boats and the opening foggy title sequence. Location shots? OMG The home? is the Speckle's Mansion, current home of Daniel Steele. 2080 Washington St, when the front entrance was in the middle of the block You can see the street sign and the garage entrance. There is a great shot of Lafayette Park across the street. Butcher Town bridge is Lefty O'Doul's bridge at the new AT&T ball park. I'm sure there is more and I have just started researching! Thanks Dan. I didn't recognize either as famous landmarks. 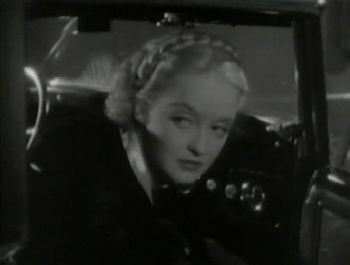 The bridge is in what I referred to above as a pier scene and the home Margaret Lindsay drives up to is the Spreckles Mansion, which is in the "driving scene" I also mentioned. 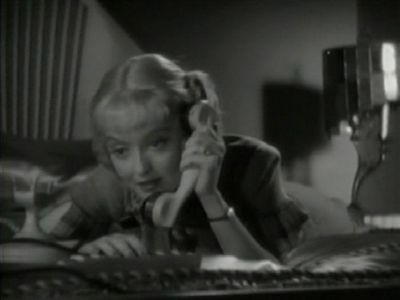 My husband and I just watched the 2nd half of this movie last night, and I stumbled upon your blog when googling images of Bette from the film. I love anything Bette, and had never before seen her in this. Ironically, we turned the tube on too late, as she'd already been murdered by the time we stumbled upon it in the t.v. guide menu. I completely forgot about it! There's no excuse, either, as it's in my notes from watching the film. I wrote: "At 36:15 into the film there is a SPANKING GAME. WTF?!" Hahaha wow! Yeah, that just came out of nowhere, didn't it? 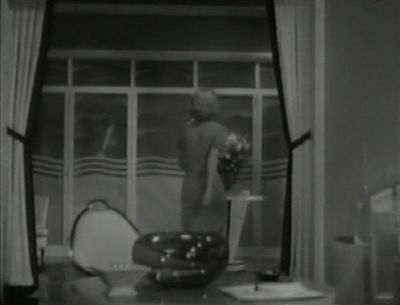 Fog Over Frisco is a fun little move, with Bette in fine form. I'm slowly discovering more of her 1930s movies.